All of you RX-Q fans out there…..pay attention. If your old lid has been put through its paces, it might be time for an upgrade. Cash in those gift receipts and check out Arai’s new RX-Q graphics. The Arai RX-Q Electric graphic is very geometric. 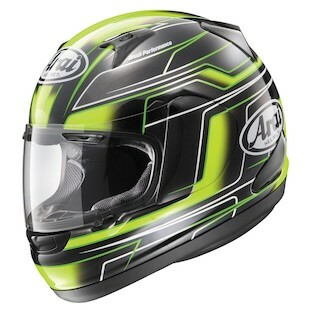 Arai incorporated numerous eye-catching lines, shapes, and colors. The Electric graphic is attractive from and stylish and safety standpoint. Both color options, Red/White/Blue and Green/Black, are head-turners. The Arai RX-Q Flame graphic is radical. 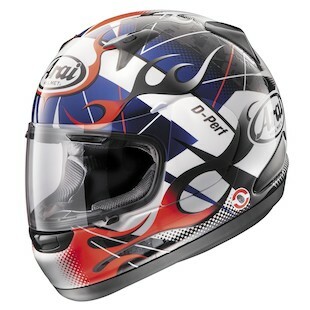 This graphic screams late 80s, trackday lid, with flames bellowing under the clearcoat. The crazy Red/White/Blue color scheme doesn’t match anything, which adds to its awkward 80s flair. If you want to look ridiculously awesome, this graphic is LOUD and proud! The Electric and Flame graphics are solid additions to the RX-Q line. Their level of depth and detail is common practice for Arai, but never gets old. Each graphic offers a unique perspective that will attract a unique motorcyclist. You’ve done it again Arai!